Some people might look at this grapevine with frost damaged leaves and decide it is time to go get a shovel and queue up Chopin's Piano Sonata No.2 in B Flat Minor, Op.35, CT.202: III. Marche Funebre to play on their iPod while they commence digging out the vines. Everyone knows Chopin's Piano Sonata No.2 in B Flat Minor, Op.35, CT.202: III. Marche Funebre. Hum along... dum dum de dum dum de dum dum dum dum dum. It's commonly called the funeral march. But stop and think a minute. Why would that be the first song that comes to mind when you see an entire grape vine with frost damaged leaves? Oh, ye of little gardening faith. Let's apply some reason to this and think this through. When I go see old gardens, I often see an ancient looking grapevine growing along a fence or, as mine is, growing along a couple of heavy duty wires strung between two old posts. 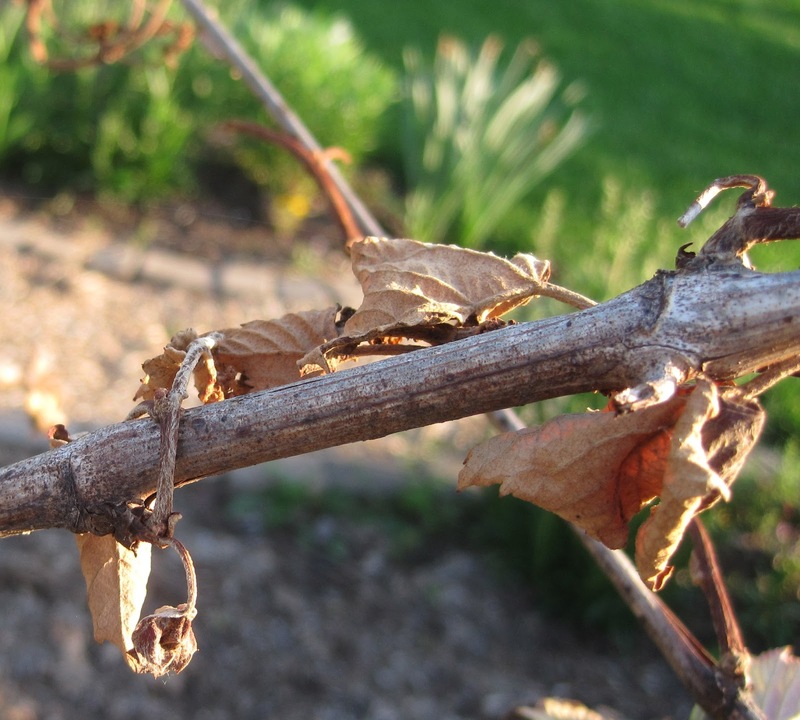 Those grape vines sure didn't grow old by wimping out every time they leafed out and then got zapped by frost in the spring. No siree hort-bob, they didn't. Dum dum de dum indeed. 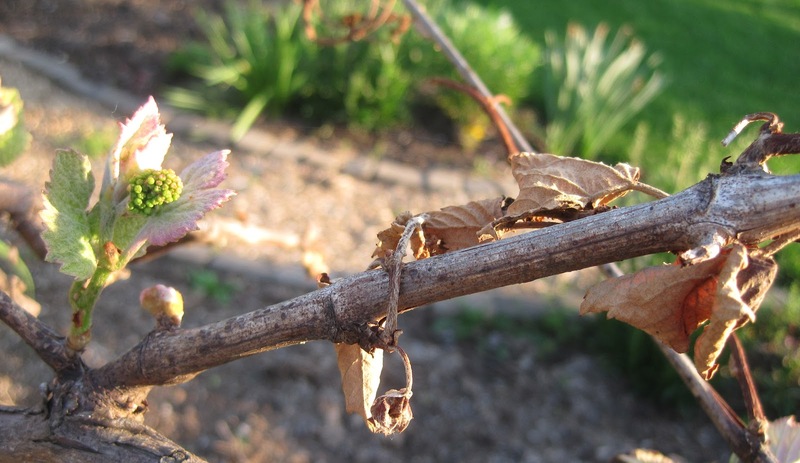 Just look at my grapevine now. New leaves and new flowers. By jove, I think I will get some grapes this year after all. I never doubted that for a second. Queue up Handel's Hallelujah chorus, a better song for this occasion. Everyone knows this song, too. Hal----lelujah! Hal---lelujah! Hallelujah. Hallelujah. Hal-leeeee-lujah! Or something like that. Have faith that most plants will recover from being zapped by late frost, and some will even grow new leaves and flowers. Patience pays off. Or is it procrastination? Love it! Love it! Da da de daaaaaa... Da da de daaaaaa... da da de da, da da de da, da da de daaaaa, da da de da, da da de da, da da de daaaaa.... I'm singing this in my head and drawing a complete and total blank on the composer! But it sprang to mind immediately and all because of you, I'm going to be singing this all night LOL.